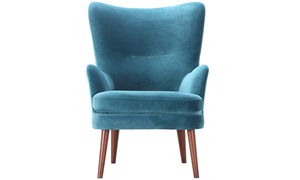 Whimsical wingback, teal accent chair offers a bold blend of durability, comfort, and design with a fully-padded hardwood frame and contemporary, inspired Mid-Century Modern flair. 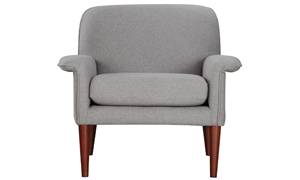 Light grey accent chair features a distinctive key-arm silhouette, contrast welting details, tapered wood legs, and a contemporary compact, small-space friendly design. 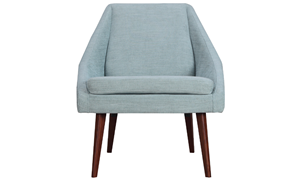 Light, eggshell blue contemporary, geometric accent chair boasts a fully-padded hardwood frame and subtle stylistic details, creating a chic, comfortable piece with plenty of personality. 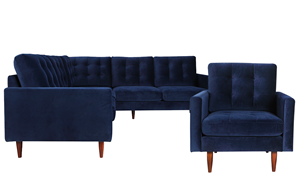 Compact, small-space friendly 3-piece living room set features a sectional and accent chair duo with tufted back detailing, tapered wood legs, and bold, dark blue velvet-look upholstery. 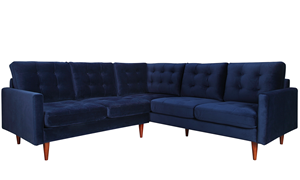 Compact, small-space friendly sectional features tufted back detailing, tapered wood legs, and bold, dark blue velvet-look upholstery. 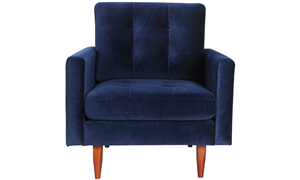 Compact, small-space friendly accent chair features tufted back detailing, tapered wood legs, and bold, dark blue velvet-look upholstery. 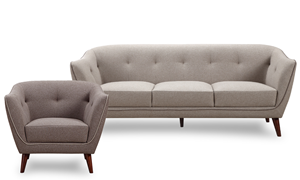 The small-space-friendly Marx Chaise Sectional features a selection of premium materials and showcases a variety of designer techniques, ensuring lasting comfort and chic, casual style. 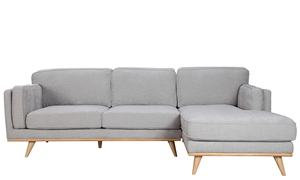 This small-space friendly living room set features durable, hardwood frames, comfortable baffled-back-cushioning, and sleek, designer detailing for high-quality, long-lasting, contemporary style. 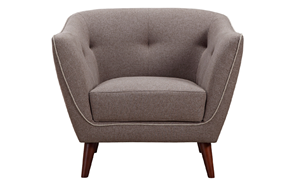 This small-space friendly accent chair features a durable, hardwood frame, comfortable baffled-back-cushioning, and sleek, designer detailing for high-quality, long-lasting contemporary style. Chic, Mid-Century Modern pastel-mint sofa boasts stylish button-tufted back detailing, fashionable flare-arm silhouette, and whimsical retro design. Chic, Mid-Century Modern pastel 2-piece chair-and-sofa set boasts stylish button-tufted back detailing, fashionable flare-arm silhouettes, and whimsical retro design. Chic, Mid-Century Modern pastel-yellow accent chair boasts stylish button-tufted back detailing, fashionable flare-arm silhouette, and whimsical retro design. To celebrate our 120th year, Haynes is paying homage to our roots in the Hampton Roads community by bringing back the iconic Furniture Hall in our Virginia Beach location. An eclectic mix of local Virginia designers and international names make this a one-of-a-kind showroom experience that you won't want to miss: Unique reclaimed pieces from Roanoke's Black Dog Salvage sit next to colorful upholstered seating by New York Times best-selling author Justina Blakeney. Leathers from Lynchburg's Moore & Giles grace Whittemore Sherrill sofas and chairs displayed alongside luxury handmade mattresses from Aireloom of California. Conrad Grebel's custom made solid wood dining and bedroom furniture share space with the ultra glamourous living, dining and bedroom pieces from Jane Seymour & Michael Amini. There's more to come as new items are floored every week, so check back often!